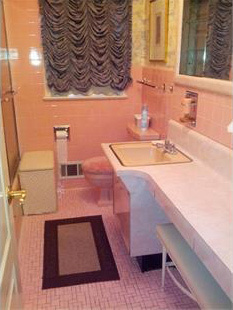 We’ve prioritized things like a new roof and updating the basement, and because the bathroom tiles are in great shape and the layout is just fine, we decided to tone down that popular pink and blue by installing white toilets and vanities. We (or rather, Adrian) stripped the horrible wallpaper and painted the walls and ceiling bright white, and I installed new switches and plate covers along with a much brighter and safer light fixture. 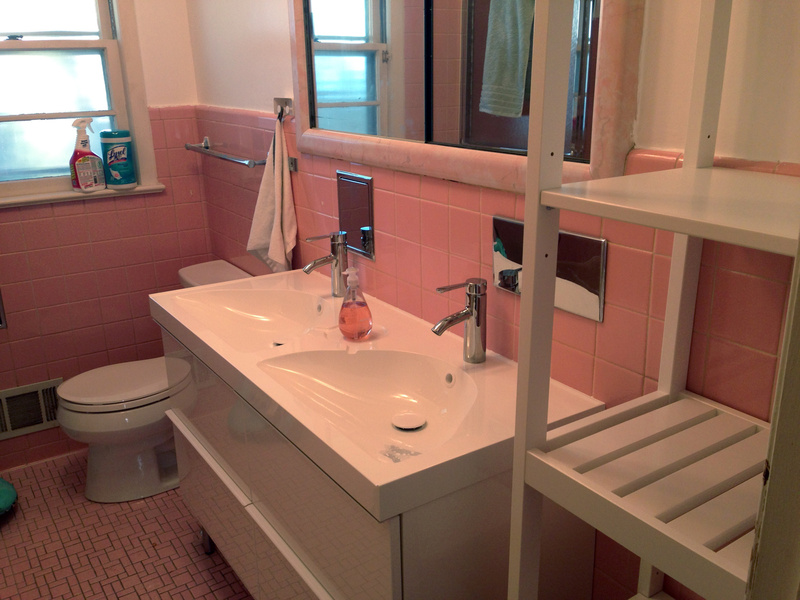 We got Kohler toilets through the contractor who’s working on the basement that look fantastic and are low-flow, and IKEA sinks and vanity cabinets. The plumbing for these sinks is extremely non-standard and the cabinets we decided on had drawers, meaning very little clearance in the back, so we had to hire a plumber to wire them up; he seems pretty frazzled by the experience. But it’s done, and we are very happy. The white balances the colored tiles well (the master bathroom is the blue one), we get way more sink and storage space, and best of all: it’s clean. OMG OMG OMG this is so… rad. Love it. And then everything clashed and the house lost its own personal seal… how disgusting is to have all what everyone else has in their bathrooms… especially low quality vanities that will be swollen and gone in a couple of years whereas the original one was there for 60 years. Are you… are you okay?